The paparazzi are still camped outside the gates of his home and helicopters still follow him each time he gets behind the wheel of one of his cars. 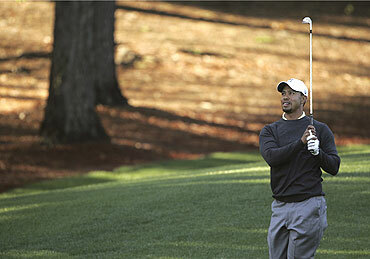 But life for Tiger Woods is starting to get back to normal. The fascination about his personal life is starting to fade and the focus is returning to his golf game. 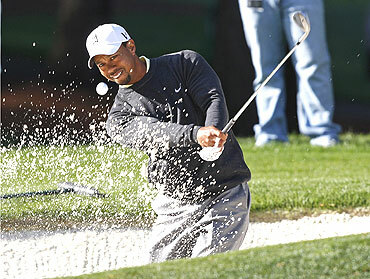 When Woods made his comeback at the US Masters earlier this month, the cynics sneered that the tournament was so heavily policed that spectators and media were bound to be on their best behaviour. His critics and supporters agreed that the real test for Woods would come at his first appearance at a regular tour stop, which he confirmed would be this week's Quail Hollow championship in North Carolina. 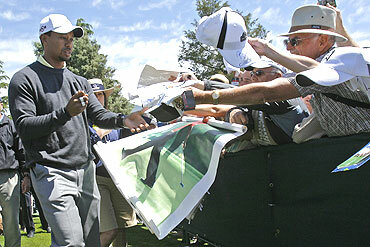 The galleries were bigger than normal when Woods turned out for Wednesday's pre-championship pro-am on a crisp spring morning and the media were on hand to record his every move. But if his first real public appearance was anything to go by, the American may have already won his biggest battle. There was no animosity whatsoever and crowds welcomed him back with open arms. He responded by graciously acknowledging them and engaging them with almost slapstick comedy, something he had neglected to do in the past. He shook hands, signed a few autographs and even posed for a photograph with a young boy. Woods then trotted off to the media centre to face his inquisitors with the confident swagger of a man who knew he was already winning one of his biggest battles. "I'll tell you what," he told a packed news conference eagerly scribbling down his every word. "I think it'll be another great week." He defended himself over criticism he received for attending a pop concert during the fortnight since the Masters and provided another assurance he would not repeat his infidelities. "Not after what I've been through," he said. The expected grilling from the media never occurred and the questions quickly turned to the state of his golf game. Woods revealed he was still having trouble with his swing and while he was still not happy with his fourth place finish at the Masters, he was learning how to deal with failure. "I think it went as well as it could have possibly gone," he said. "Obviously I didn't do what I needed to do on the weekend, but overall after not playing for that long and coming back and finishing fourth, I think that's pretty reasonable. "I didn't quite have that approach when I was a kid. Things used to be thrown, things used to be broken around the house, in my room. "I took losing very hard at the time. Very, very hard." The World No 1 won the Quail Hollow championship in 2007 but was not making any bold predictions about winning again this year, despite already feeling better about his game a fortnight after his comeback. 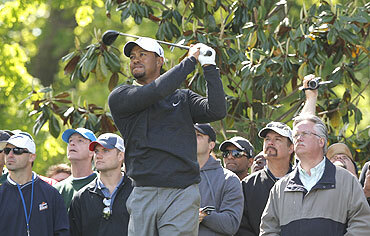 "I have to say this feels a heck of a lot more normal than the Masters did. I just need to go out there and do a little bit of practice session this afternoon, gym work this afternoon, as well, to get ready for tomorrow, and back into tournament mode again," he said. "Two weeks in a row competing... I'll have a better barometer of what normal really feels like because I haven't done that in a while."